There was nothing Little Bear liked better than visiting his grandad every Friday. They had tea together, and then climbed up into the tree house in the garden to look out at the big wide world. Grandad told Little Bear stories of when he was young. But one day, Grandad was taken to hospital. He was too weak to tell Little Bear a story, so Little Bear told him one instead and, afterwards, Grandad fell into the deepest of sleeps. 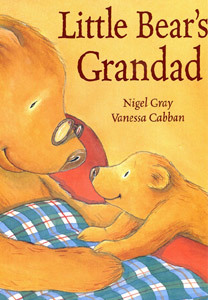 Nigel Gray’s gentle text and Vanessa Cabban’s poignant illustrations tackle with great sensitivity the subject of death in the family.